Hai there! Just when you thought you had spent all the cash you were going to on your respecs… there are some more changes. And I had JUST gotten pretty happy with my current specs. Some of the changes are tweaks for the better, and some have already been implemented. I’m just going to focus on the ones that might impact the way you spec. 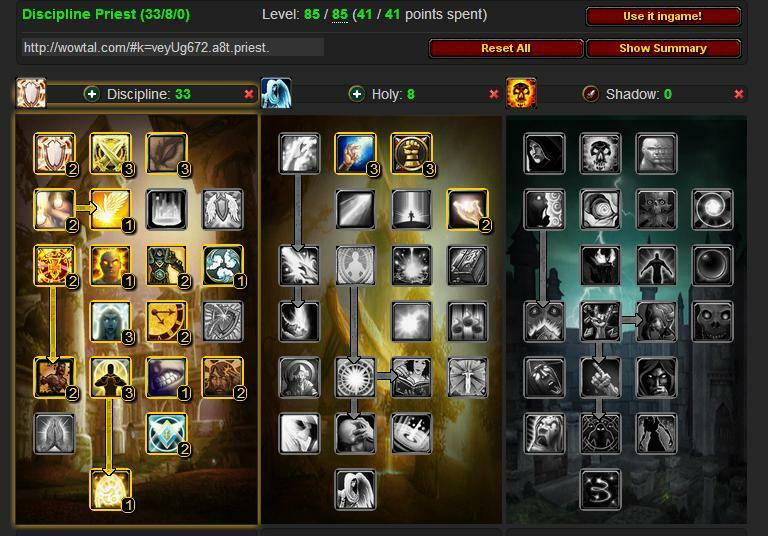 Strength of Soul now also procs from Greater Heal and Flash Heal. 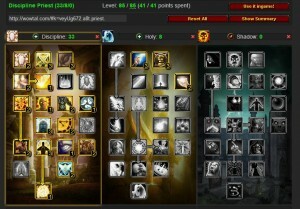 This change was reported on MMO Champion but not on WoW Insider or Curse…. and it’s not a hotfix because it’s not live in game. So this might not be happening. But I really hope it is! If you recall, my main argument against strength of soul is that when you’re freaking out because you want that weakened soul debuff to disappear so that you can re-bubble the target, you are probably using GHeal for the big numbers and not that wussy Heal. Now this talent seems really solid for tank healing. Want to test! Power Word: Shield: mana cost has been increased by approximately 31%, but its effect has been increased by 208%. Shields are more powerful. But they are also more expensive. It’s pretty clear we’re not going to be tossing bubbles on GCD. You may want to ditch Soul Warding, especially in a smite spec. Though it’s deep in the holy tree, this may be worth considering for your disc spec now that it’s bulked up a bit. There are some minor changes to Atonement, Pain Suppression, Grace, and Rapture, (for the best) but those talents you were going to take anyway. I’m opting for a smite build here, not because I necessarily think it’s the way to go for healing (jury’s still out on “smite + disc = BFF”), but because I need some offensive capabilities in questing. Though Desperate Prayer is bulked up a bit, in disc spec I will probably opt for bubbling myself (especially now: “Improved Power Word: Shield now also increases the amount absorbed by an additional 15/30% when cast on oneself”) rather than using desperate prayer. But it’s not a bad choice, and I might reconsider, especially if I end up freeing up some points with a non-smite spec. I opted to get to Inspiration in Tier 2 of the Holy tree rather than trying to pick up haste or shadowfiend talents in the shadow tree. I really believe that inspiration is an awesome talent for effective tank healing. I’m still not sold on Train of Thought, but I’m trying it in lieu of Soul Warding. Basically these are my two bonus points, and if Train of Thought doesn’t work out, I can put them into Surge of Light (which is more viable, see below) – after all I am smiting, Veiled Shadows, Darkness, or Desperate Prayer. Chakra‘s state now last 1 min, up from 30 sec. Uh, are you going to take State of Mind now? I’m sure as hell dropping the one point I currently have in it. 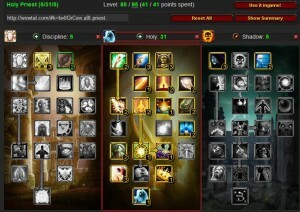 Surge of Light now also procs from Flash Heal and Greater Heal… and can crit. 6% proc rate is low, but not prohibitively low anymore now that it procs from most of our direct single-target heals now. I’m taking this one. Totally. I’ve always taken this talent anyway in holy spec, but some people don’t. Now it’s probably worth it. And some minor changes to Holy Concentration and Holy Word: Chastise that probably won’t affect how you spec. No State of Mind, Rapid Renewal or Fail Angel. I opted for a lowered cooldown on shadowfiend for raiding. Would you mind adding a no-smite Disc build? I’m a bit hesitant with my priest theorycrafting but I want to switch my smite spec for a no-smite; my offspec is shadow so I don’t need the dps talents for questing. There are 2 “bonus” points at the end to do what you want with them. (1) I still took soul warding, because there is nothing THAT good at the top of the tree. Inner sanctum could be a viable alternative, but I think that talent is pretty weak, unless you are getting hit too much or need to move extremely fast. (2) I took train of thought because, again, I needed to fill out some points. Those points could be shifted to inner sanctum. I think that if you use Gheal a reasonable amount, train of thought is good for mana management. (6) Last 2 points? Don’t think you need haste since you’ll just OOM faster – and healing is much slower paced. Maybe shadowfiend for mana, surge of light for freebies (now that it can proc from fheal/gheal), desp prayer as a panic button. Thanks muchly! I’m having fun with my disc priest but she’s definitely not my go-to healer; I do want to feel comfortable on her, though. Train of Thought is the kind of talent that wouldn’t see much use in a clockwork raid or instance where everyone knew their roles and nobody stepped in fire, because you really shouldn’t be going out of your way to cast GHeals just to get Inner Focus back sooner. But when you do need to throw Penance at a dps (or yourself – I do my fair share of screwing up), plus maybe a GHeal (or, gasp, two) before going back to smiting to keep a baseline amount of tank healing going, it’s a relief that all that mana wasn’t absolutely wasted. The GHeals have shaved a little off your next Inner Focus, and you can use Penance to put Grace back on your tank a couple seconds sooner. As for Strength of Soul, it’s finally tempting. 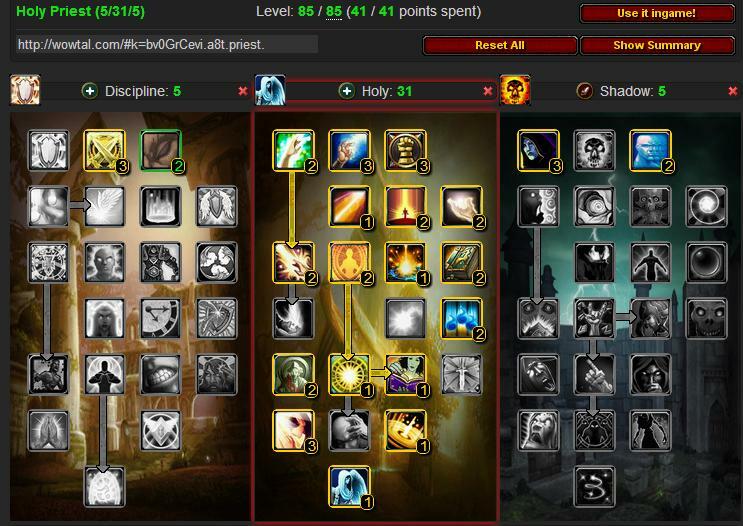 I haven’t cast Heal since the first couple days of 4.0.1, so it never appealed, but if you can shave off weakened soul with spells you’re actually using in a dungeon or raid (as Atonement, obviously Heal’s essential for everyone else) it might actually be worth juggling some points. I’ll wait to see how stronger shields feel – at the moment, mine seem a little weak. Not sure if that’s a gear thing, a mastery thing, or if I’m still in a Wrath mindset and expecting to be able to bubble the tank and go make a pot of coffee. As I’ve said before, I’m really not sold on train of thought, but other priests seem to like it so I’m going to give it a shot. Strength of Soul didn’t make it into the “official” patch notes, so not sure that is going to happen. BUT I HOPE SO!